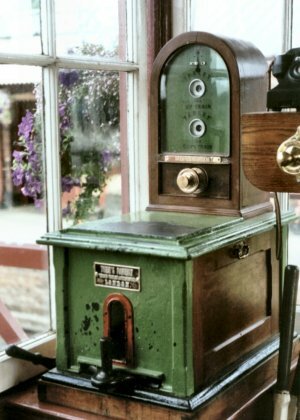 Most of the telephones shown are contained within the signalbox at Tenterden, which is at one end of the line and the start point for most journeys. Exemplifies the design principles discussed in my article on signal post telephones. Standard BPO keys and switchboard lamps are used here. The labelled keys are to: Rolvenden Signal box, Cranbrook Road Crossing, Up Home signal, Loop stopboard, Headshunt points and two more I can't read. 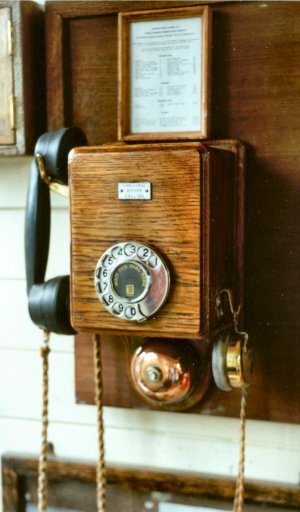 You can see this is very similar to the Ericsson battery-ringing telephone shown on the railway phones advertisements page. The butterstamp type of receiver is replaced by a watch-pattern receiver and the calling buttons by a lever key. The side label says "Challenge before calling". The upper key position is labelled Tenterden - Rolvenden, and the lower key position look like Wittenham - Northiam. Notice the similarity again to telephones shown on the railway phones advertisements page. 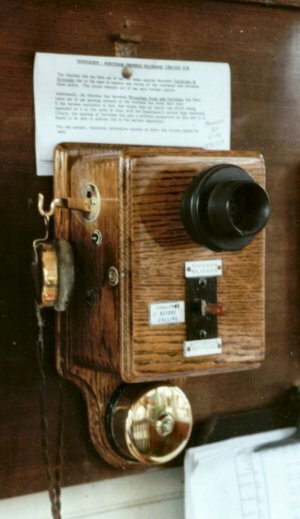 The label says, as before, "Challenge before calling". Fellow THG member Nick Wellington, a volunteer on the K&ESR, tells me this phone had had a varied history, starting as a fixed transmitter type, then converted to handset working and finally fitted with a dial. The dial label has the Telephone Rentals logo and the instruction "Wait for dial tone". Above the phone in a frame is a list of telephone numbers. 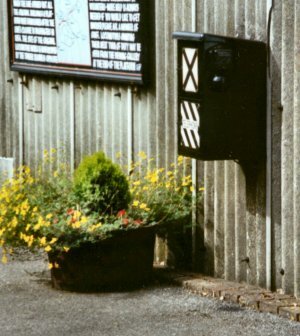 The trembler bell is rung by a relay operated by ringing current. 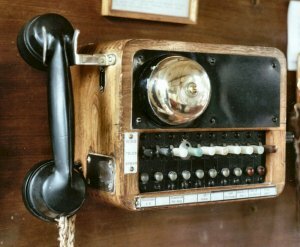 Before the development of the weatherproof telephone most outdoor telephones were like this - a box containing a normal desk telephone. It says a lot for the resilience of the 200 and 300 series telephones that they performed well in the uncertain British climate with only a steel box to keep the rain off. Although this is really signalling equipment, it's so nice I had to include it. This is a token machine for controlling single line working. It is linked to an identical machine at the other end of the single-track section and the machines will only allow one token to be released at any one time, preventing two trains from entering the single-track section at once. 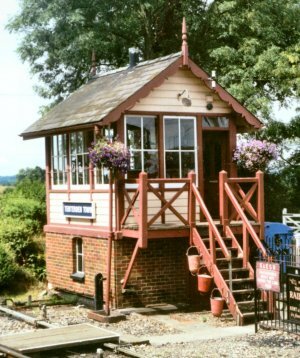 You can visit the Kent & East Sussex Railway's own Web site at: http://www.kesr.org.uk/ for the history, opening times and prices. But if you want to see some pictures of the trains, I recommend Alan Newble's site. Next, take a look at the telephones I photographed at the Kidderminster Railway Museum.